The idea is to promote the judo culture for all and especially for the young ones throughout activities that directly concern them. The poster and the comic book were particularly adapated to spread the message to the youth. The authors are tallented graphic designers, who are working for major US video games companies. One of them participated in the worldwide know Angoulême Festival. The files can be downloaded, printed and distributed without being modified or sold. Timisoara hosted the most extensive event ever, dedicated to judo. The demonstration organized by Judo Phoenix Club, led by Laurentiu Jurca brought together over 100 judoka, aged between 3 and 14 years from C.S. Pro Motrica Timisoara, CS Gloria Arad, CSM Arad, Eliana Club and CS Judo Phoenix Timisoara. 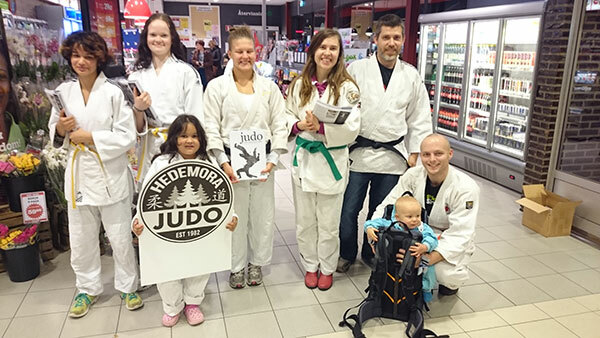 With this special “World Judo day” which marks 154 years since the father (Jigoro Kano) of judo was born, dozens of small judoka from Timis have responded to the Judo Phoenix Club invitation. It is an “HONOUR” to inform everyone that our wishes to have a dojo dedicated only for judo has complete. Happy World Judo Day!!! Greetings in behalf of Mapua Judo Club. 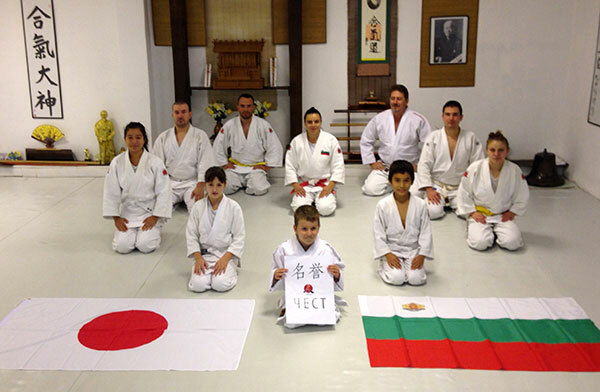 "I'm the main instructor in school Yawara in Sofia, Bulgaria. 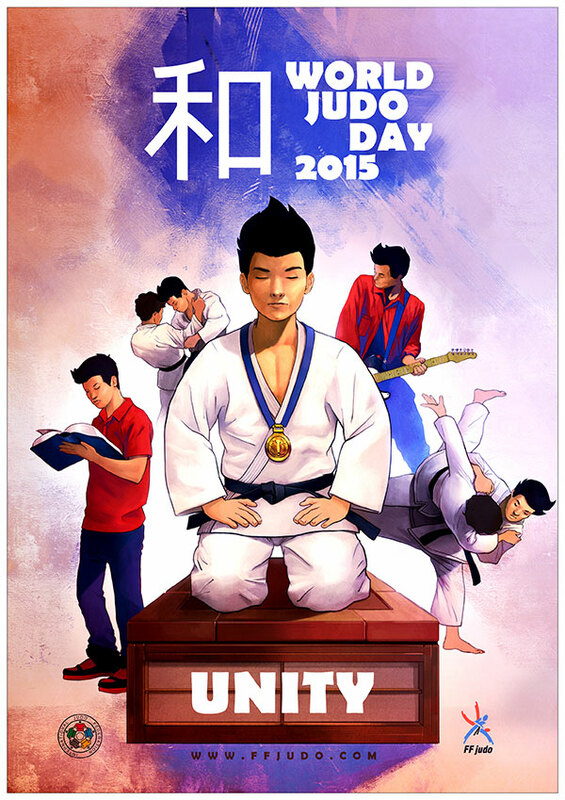 On the occasion of the World Judo Day, we organize several events to promote and spread more judo in our country. School Yawara did lectures for the kids together with the parents on the history of judo and what judo teaches. We gave them the task to make drawings on the World judo day. Our action took place in Pavilhão do Conhecimento, a Science Museum in Lisbon, Portugal. 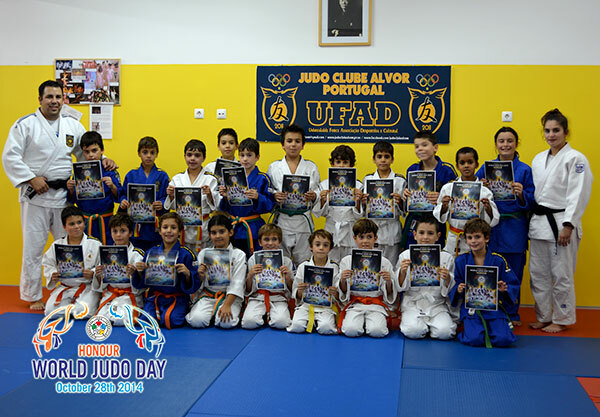 The celebration of WORLD JUDO DAY was pontual, but this is a project that started this year in Lisbon, that can be replicated all over the world. Until December 550 kids will have this playful contact with judo, from 22 different schools. In an environment of mutual respect, friendship and politeness, Olympic and Paralympic judokas as well as athletes from "Judo for All" and social projects have gathered at the dojo of the International Airport from Rio de Janeiro. A great gathering to celebrate the World Judo Day. So one can describe the training that has been run at the dojo of the Brazilian Judo Confederation this Tuesday, October 28th. Olympic and Paralympic judokas as well as athletes of "Judo for All" - people with physical and intellectual needs - and members of the Reação Institute from Rocinha have gathered for a great workout under the leadership of the men's national team coach Fulvio Miyata and the coach Yuko Fujii. 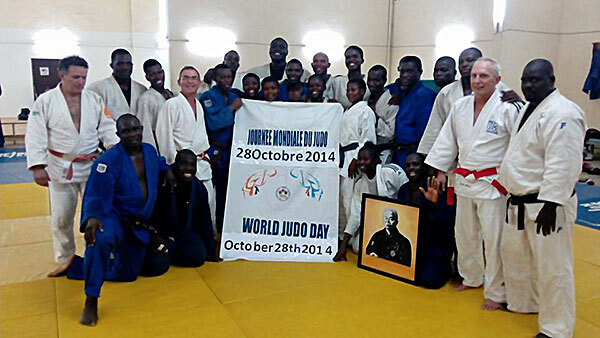 The theme chosen this year by the International Judo Federation for this sport’s day was Honor. Sharing the mats with different judo practitioners has been a special occasion for the attending athletes. "It's a great exchange. We help and learn a lot from each other. Antonio Tenorio is an example for everybody. He has four Olympic gold medals, an achievement that I haven’t reached yet" Rafaela Silva said. "We train with some of our idols here, people we admire and support. They end up being an inspiration because they use to compete in the Olympics before us and that’s why they inspire us for the Paralympics. It was great to see children, Olympic and Paralympic athletes on the same mat together ", said Karla Cardoso, silver medalist at Athens and Beijing Paralympics. "We are proud to train with the Olympic and Paralympic athletes. A champion can always develop themselves. It's really cool to be putting your hand on the kimono of world champions, world medalists, Paralympic medalists and also on those of the children who will be the future members of the national team, "said Breno Viola, the first Down syndrome-judoka from the American continent to be awarded a black belt. Besides the above mentioned participants, the activities have been attended by senior athletes such as Victor Penalber and Barbara Timo; the Paralympic athletes Williams Araujo and Roberto Julian; members from "Judo For All" like Antonio Lima (fragile X), Saulo Palotte (physical disability) and Guilherme Paiva (Down); as well as the children Renan Andrade, Renan Miguel, Caíque Miguel, Daniel Rian and Igor Rodrigues Pinto. The latter made some randoris with Guilherme Paiva. For him, this wasn’t that different. "I’ve really enjoyed training with Guilherme. I wish I had more workouts like this, "said the young 12 year-old judoka. "Now, in such kind of situations, we can see the size of judo. It is much greater than the daily training and the high yield. We can see the Paralympic judo, the "Judo For All" project, the children who learn how to practice the sport in social projects. It's pretty cool to realize that it’s much more than a sport, it is a philosophy of life, “Victor Penalber said. "This activity helps us see what this sport means and, more specifically, what judo actually includes. We have seen people with different disabilities (visual, motor, intellectual) training with senior athletes and children with no problem. 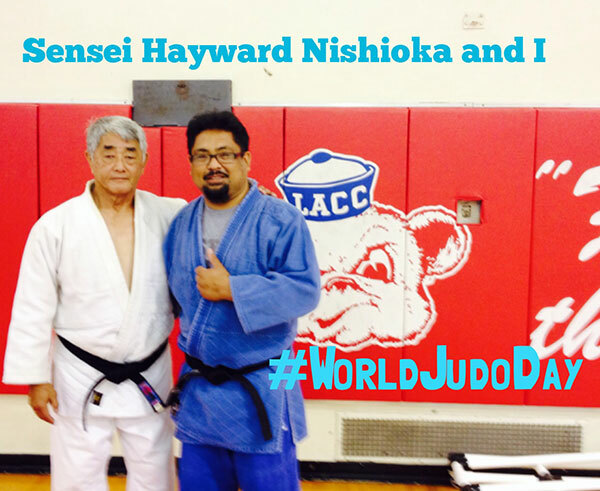 This World Judo Day strengthens further our sport, “the coach Fulvio Miyata stated. Honor, mutual respect, friendship and respect are just some of the judo basics highlighted by this activity. "We celebrate with Adrian Gandia. 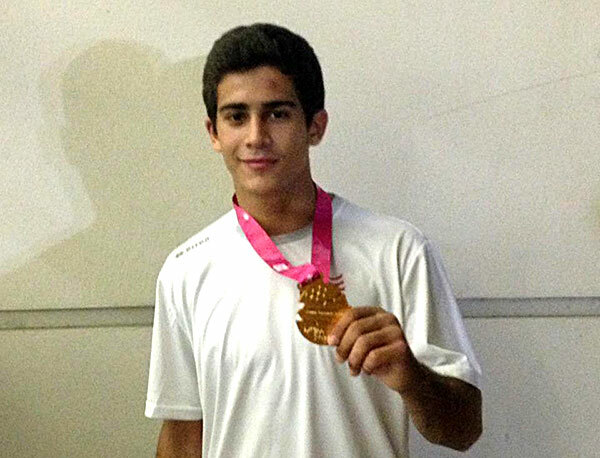 Gold medalist in judo at the Olympic Youth Games in Nanjing. We talked about his experience as an athlete and Olympic theme this year, HONOR. Congratulations to all athletes of judo. 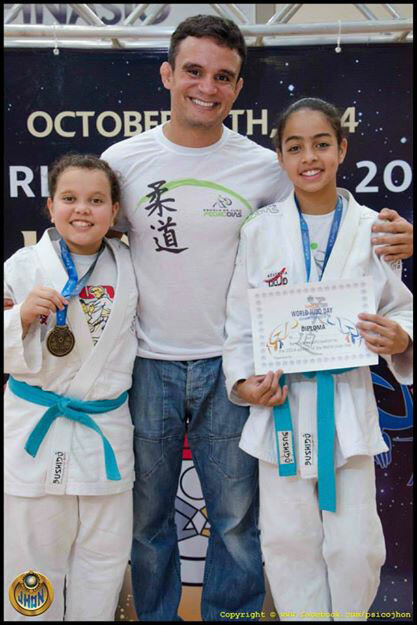 Judo more than a sport ..." Carlos Santiago , Master Judo Puerto Rico . "I'm an amateur judoka and in judo I've found a great sport made of great people. This is honour for me." Francesca. "This pics ilustrate the concept of honour, It involves personal acceptance and construction of a moral quality linked to duty, virtue, merit, patience, and it involves the hard work to become a better person..." Greetings from Mizukaze, Club de Judo Oaxaca, Oax. México. 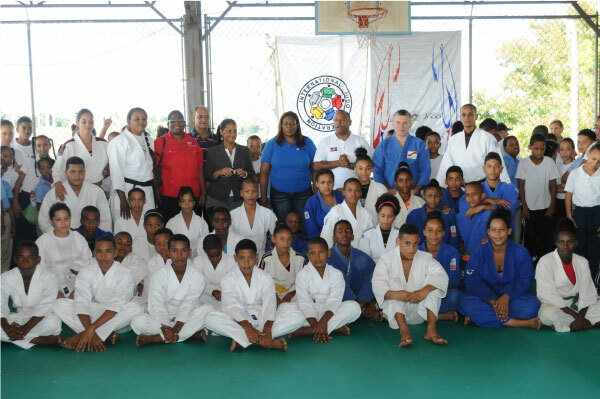 On the occasion of the World Judo Day, judo clinics were held in the premises of the Paraguayan Judo Federation. The event ran until late afternoon. 400 8 to 14 year-old children from educational institutions participated. A tournament was also held on two tatamis offered by the International Judo Federation. 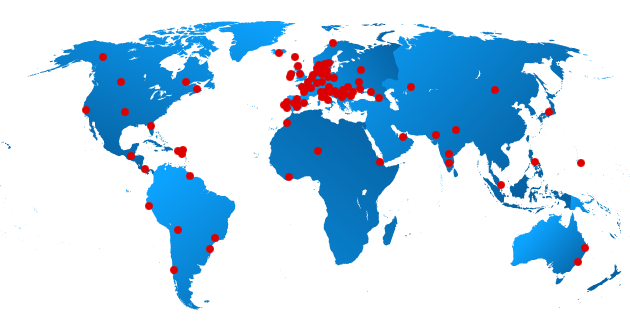 In 2014, following the activities of last year, we have prepared several projects in different clubs, connected around the world. Despite the time difference, all activities were held at the same time. 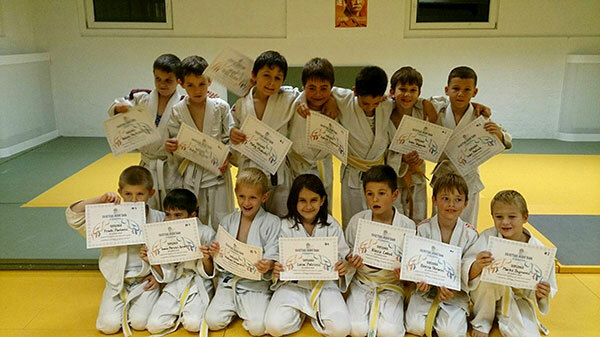 They consisted of a judo class where the 2014 theme was explained to the participants. The involved clubs were: Soriano Project in Mercedes (Uruguay), the Project States Judo in Rosario (Argentina); RIPA Project Logrono (Spain); Baby judo Project in Senegal; Oteje Olumbeja Project in Lagos (Nigeria); Project judo school Equatorial Guinea; Judo La Rioja in Argentina. "All together for judo". 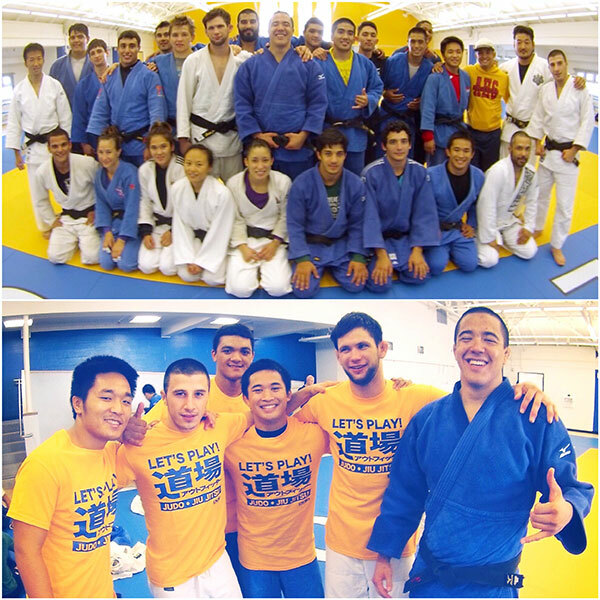 I'm reminiscing about my recent trip back to San Jose State University, home of such famed American judoka as Mike Swain, Kevin Asano, and Yosh Uchida. I graduated from San Jose State and captained the judo team between 2004-2009. It was great to see the team again and give back to them! 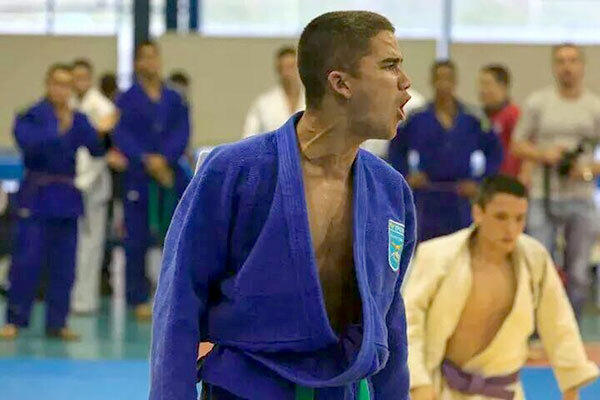 Like it happen last year, the Pedro Dias Judo School from Maringá- Brasil, coached by the former olympian and european medalist, celebrated the World Judo Day 2014 with a competition - Copa de Judo Team Nogueira. This tournament was open to more then 100 children from both gender between 4 and 15 years old and it had the sponsorship of Nogueira brothers, judo black belts. Much more than the fights this competition was a big party for all the judo lovers and there families. The "DO" concept is multifaceted, it is ample in its forms and in their acts of thinking. It allows the simplicity, not ostentation, and allows for self-examination of conscience, causing the person to maintain a healthy relationship with those who are part of their daily lives. Speaking of "chivalrous spirit" will not cause strangeness for an experienced judoka, knights warriors were characterized by their courage and by the greatness of his character, these values are refined and a superb season for the Warriors, and constituted a great reputation, including scoring heroic traits of nobility in the tradition of his people. The culture of chivalrous spirit in judo classes evolves naturally, hard training, the joys and disappointments of competitions, fall and rise dozens of times, the pride of victory, vanity and simplicity Champion. All this leads the practitioner to discover the courtesy that is within him. The chivalrous spirit can only develop if there is an ethical commitment of the judoka with its own loyalty and sincerity. 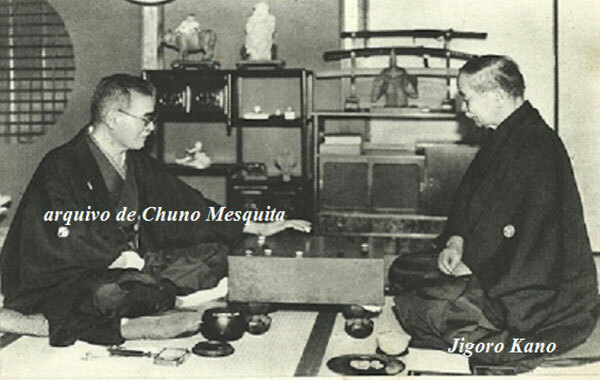 The judoka have to know how to live an honorable and gentlemanly manner both inside and outside the dojo, but with cunning and sensitivity to perceive the feeling of everything around them (Chuno Mesquita, 7ºdan). 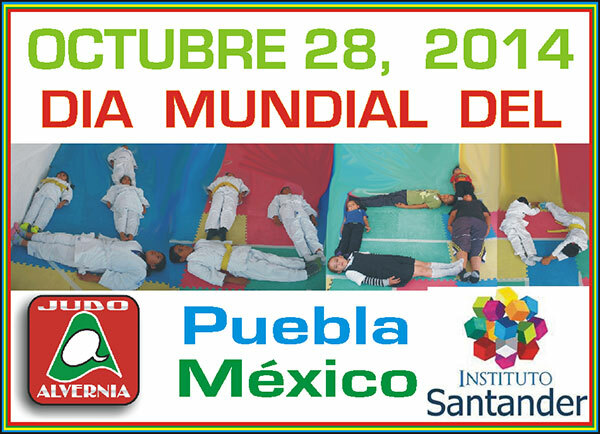 "We celebrate the day of the judo world in our club. 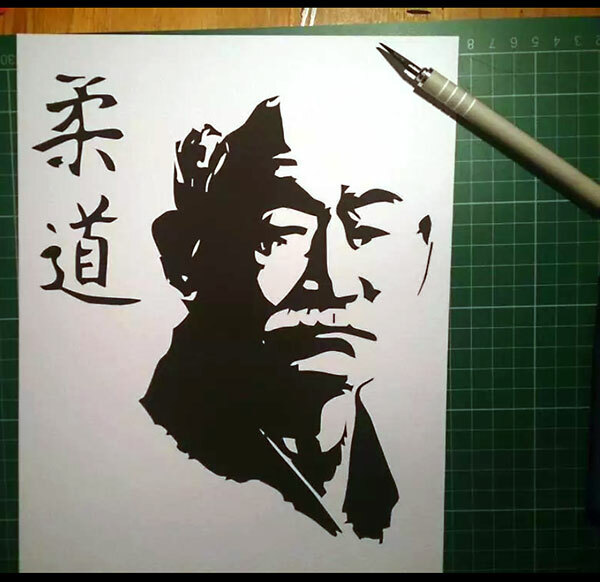 We had a class dedicated to Master Jigoro Kano and all he left us a legacy. Our young judokas had a special class where we do some different activities everyday. We hope that everyone could enjoy this day , and wish all judokas , a happy day of the judo player in the world. 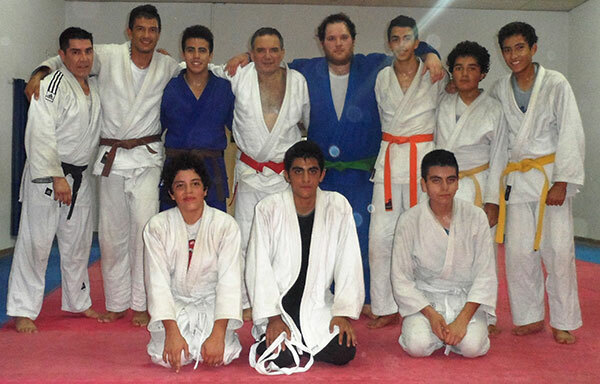 From Judo Clube Alvor in the Algarve , Portugal !!! A hug to our judo friends !!" 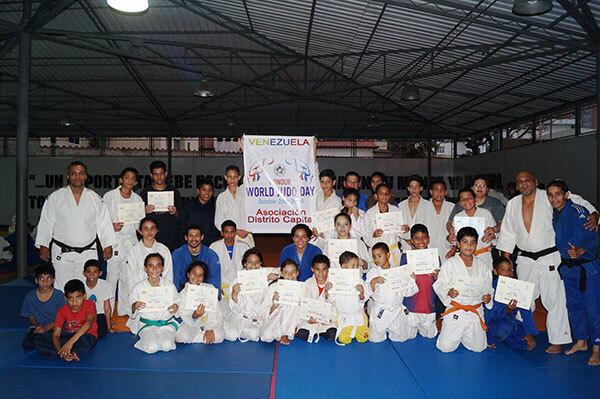 In Venezuela we celebrated the World Judo Day, with the judoka of the Capital District Association and we honored our master Jigoro Kano. 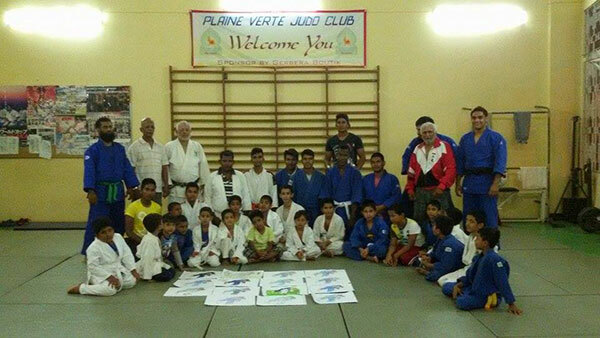 "The Plaine Verte Judo Club from Mauritius has organised a painting contest between its members to promote judo in the context of the World Judo Day. The painting will be exhibit to the public where 3 best drawing will receive prizes." Albania Judo Federation celebrate today World Judo Day. 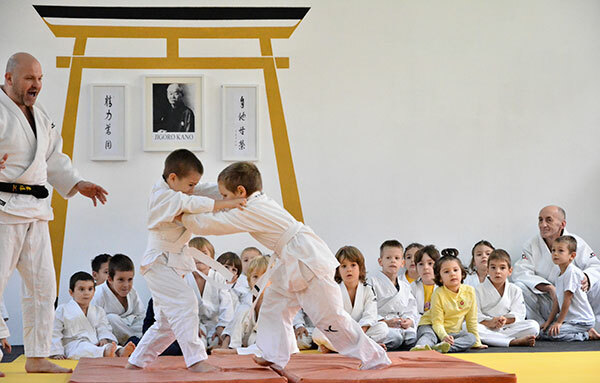 Each team of Judo organized an activity at their gym. First coaches that organised this activity were Dashamir Xhixho and Altin Pergjergji. Organizations were made in the form of games because the participants were mainly children. Albania Judo Federation also gives to the participants Diplomas of WJD .2014. "We made a spacial Open Class to celebrate the world judo day. All our work was around the values an specially the HONOUR. 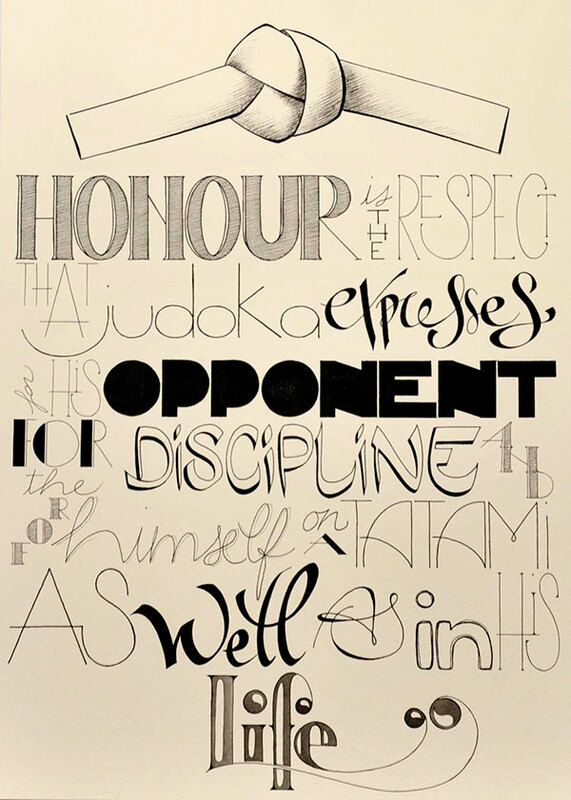 We conclude that: HONOUR is a core value for Judo, and is all for a person." SENSEI DANIEL DE LA CUEVA - ROKU DAN - FEDERACION ARGENTINA INTERCOLEGIAL DE JUDO - DOJO YUKAY - CATAMARCA - REPUBLICA ARGENTINA.